Home Health How to Choose a Juicer for Raw Foodists! 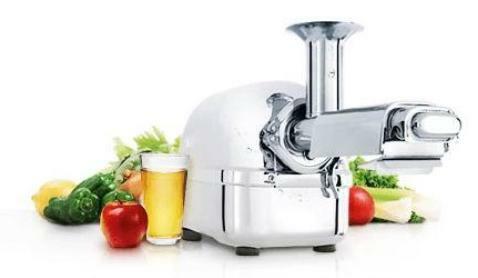 In general, juicing for raw foodists is best using the slow speed masticating juicers, available from several makers including Samson, Omega, Kuvings, GreenStar, Green Power, Super Angel and many more. Slower machines produce less friction and less heat, preserving enzymes that can be destroyed by heat. Low RPM machines “masticate” or virtually “chew” the food to squeeze out the juice. High RPM centrifugal juicers spin juice through the air causing juice to be exposed to lots of air — oxidizing the juice. Low RPM juicers don’t expose the juice to air, reducing oxidation and preserving more of the nutrition in the juice. With a 25 year history, the Champion juicer was probably one of the first low RPM juicers ever. It was, and still is, built like a tank and is great for certain applications, though it doesn’t do wheatgrass. However, it really is an all-around food processor that can also make juice — but isn’t very good at it. First, it is too fast, about 1,750 RPM, causing a bit more oxidation. I also found that they don’t get as much juice out of your veggies, leaving the pup rather wet. So today there are many better juicers that are much, much slower — as low as 45 rpm, and much more efficient at highly quality juicing with little if any oxidation. You see, high speed juicing tosses your juice through the air to be separated by a high speed centrifuge while you are making it, which means it gets a lot of oxidation. Oxidation is the enemy of your juice! So juice from a centrifugal juicer needs to be consumed within an hour or so of making it or it will start tasting nasty. It’s still a great healthy drink, but mostly when it is freshly made. In a slow speed juicer, there is hardly any air mixed in the juice while you are making it — which means little or no oxidation. You can drink this juice as much as 2 or 3 DAYS after you made it and it will still taste great! So if you make enough juice for 2 or 3 days it will still taste fresh, and you only need to clean you juicer once! The first juicer I used for many years was a Samson Juicer. I think it is still the best value for the money and the easiest to clean of the many juicers I have personally used over my 25 or so years as a raw foodist. Twin-gear juicers like the GreenStar Elite are more efficient at getting the juice out — so you get more juice and drier pulp. However, the extra cleanup may not be worth the extra price for some folks. The Samson is so easy to use and clean that you can use it daily without a problem! 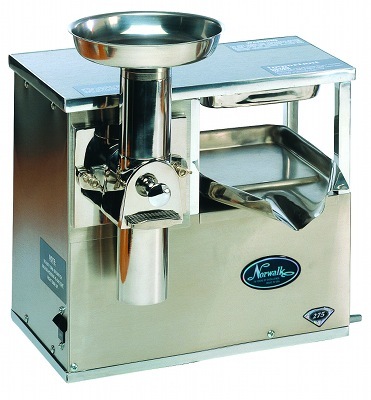 Very similar to Samson Juicers are the Omega Single Auger Juicers for a similar price. When juicing with a single auger juicer like the Samson, I like to cut hard veggies and fruits up a bit to make them easier to put through the machine. I also alternate between soft fruits or leafy veggies and the hard stuff. The Samson has a harder time with carrots than anything else, even wheatgrass – but it still does them and again, I am willing to put up with a little less juicing efficiency for the convenience of the Samson. I don’t use more than one or two carrots in a glass of vegetable juice anyway because of the sugar content – and neither should you! Try to avoid having a glass of just carrot juice – there is far too much sugar in carrots for most people! If you already know that you have some hypoglemic tendencies, then avoid carrots altogether. 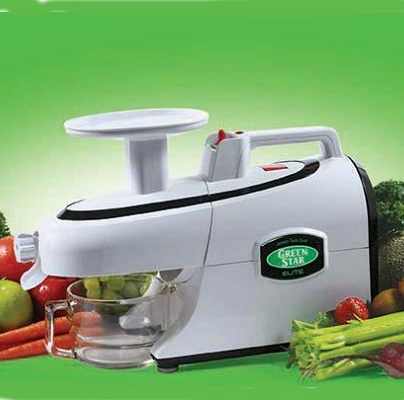 The favorite versions of the twin gear juicer are the Omega TWM30S and the GreenStar Elite. This are among the best of the twin-gear triturating juicers. Twin-gear juicers are more expensive and generally harder to clean than a single auger, but these are the really not that hard to clean. Also, these models are better for hard produce like carrots, are built very solidly and have a longer warranty. Which is REALLY a better juicer? To me the answer is the one I will actually use regularly! One of the nice things about all low RPM juicers is that you can run the pulp that comes out back through the machine a second time to extract more juice, This is a particularly good idea with the Samson or Omega juicers and radically improves it’s efficiency. On the other hand, if you choose to re-use the pulp in a raw recipe, then it is nice to leave the pulp a little wet because it will keep more nutrition and flavor in the pulp for other recipes. Most of the low RPM juicers I have tried have trouble with very soft fruits or veggies, since they have little fiber to help them move through the unit. However, I can’t think of a single time I juice nothing but a bushel of tomatoes or oranges. With veggies, you are usually mixing some soft veggies, leafy veggies and hard veggies together, and alternating the hard with the soft handles this problem nicely. The Samson works great with watermelon, with rind and seeds, no problem. The Green Star will juice just about anything. Personally, I prefer to use fruits to make smoothies in my Vita-Mix rather than juice them, but occasionally I make my own organic raw apple juice to use in a smoothie. One of my favorite things to make is to make with a low rpm juicer is “raw ice cream.” .” You just feed frozen fruits through the juicer. I start with frozen bananas as a base for any flavor, then may add blueberries or strawberries, or maybe some frozen mango. The absolute best juice for this in my opinion is the venerable Champion, using its “blank plate” or “solid plate” instead of the juicing screen. All the low rpm juicers make raw ice cream adequately, however. In the mid-price range there are a number of very good vertical slow speed juicers that became available in recent years. Their main advantage over horizontal models is that they take uop much less counter space — but that’s about all they offer. And they are not recommended if you want to do leafy green like spinach or kale. The Kuvings Slow Juicer features a large3-inch diameter feeding chute that can take in a whole apple. It is a solid and good quality juicer.If you know and trust Omega, their vertical juicers are a no brainer. Hurom vertical juicers are comparable in quality to Omegas — and are actually made in the same factory, though with some cosmetic differences. The Omega version often has a better warranty as they are a highly respected US company that’s been around for awhile. The Cadillac of twin gear juicers to me is the all stainless steel Super Angel juicer. The Super Angel Plus is the base model, that I usually recommend (about $1,250.00), though they have more expensive models as well — even one that uses surgical grade steel. Some of these juicers claim to make nut betters as well. They do a so-so job at that, in my opinion. I have an inexpensive “bullet” type blender sitting right on top of the counter at all times, which is great for quickly making nut butters, salad dressings and, when traveling, even smoothies. They can produce a little more heat, so you have to be careful, using them in short burst to keep heat down to a minimum. But they are so much faster that I personally think the speed compensates for that to some extent, and they work better for things like nut butters or grinding spices. The last option to consider for the idealist — or people with more serious health challenges like advanced cancers, is the hydraulic juice press. The most well-known is the Norwalk Juicer, which sells for around $2,500.00. While these offer the lowest oxidation and highest efficiency of any other juicer, they require a very cumbersome 2-stage juicing procedure that’s cumbersome to use on a regular basis. 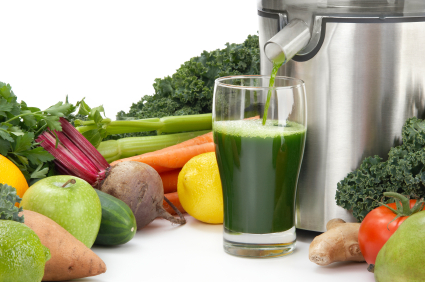 Without more motivation like a serious illness you are better off getting a juicer that you are more likely to use regularly, like the Super Angel or GreenStar Elite. A juice press does get the most juice from your expensive organic produce, however, as you can see from the Juice Stability Study, the single and twin-gear juicers are pretty close. In my opinion, it isn’t worth the difference. In addition, if you already have a Samson, Omega, GreenStar or Super Angel you can buy an inexpensive manual juice press for about $3-400.00 to supplement your own juicer if you really think you need it. This however may be a lot more work than yu think given the additional cost of the electric juicer you need to use with it. However, this option lets you just take the pulp that comes from your electric juicer and squeeze even more high-quality juice out of it. However, there is a lot more cleanup so in my opinion it is really only for the most dedicated juice lovers or folks with a significant health challenge. The bottom line is that the best juicer is the one that meets your budget and your needs! Over the last few decades I have owned a Champion, a couple of centrifugal juicers, a Samson/Omega, a GreenStar Elite and a Super Angel. Ultimately, I was able to get great juice out of ALL of them and to juice about anything I wanted. CLICK HERE to see my Juicer Comparison Chart for more details on the most common low RPM juicers on the market today. Originally published April, 2010. Updated March, 2017. Sorry…not a twitter user, though I have an account and make start tweeting eventually. You can find me mostly on Facebook at RawFoodGuy. If some one desires to be updated with most recent technologies then he must be pay a visit this website and be up to date daily. Thanks for visiting my website and your nice comments! It’s going to be ending of mine day, except before finish I am reading this wonderful paragraph to increase my know-how. Thanks for visiting my site…and keep on increasing your know how!